Being that Nashville is a town built on the monetization of music, it’s remarkably refreshing to watch talented songwriters who are more concerned with community than commerce. 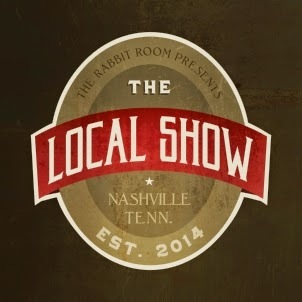 A roomful of lucky listeners got to experience that very thing last night at the inaugural kick-off of The Local Show – a recurring songwriter showcase series put on by Andrew Peterson and his creative collective known as the Rabbit Room. From the opening reading of a Wendell Berry passage that spoke of broadening the membership of your life, to the partnership with local non-profit Show Hope, to the borrowed capos and guitars on stage, the theme of community ran deep throughout the night. The first night of The Local Show featured some of Nashville’s best kept singer-songwriter secrets: Sandra McCracken, Don Chaffer (Waterdeep), Randall Goodgame, and Eric Peters. What was immediately noticeable about this foursome – and what makes The Local Show such an immediate standout from the typical songwriter rounds that take place all over the city – was the spirit of creative camaraderie between all of the artists. Not only are they all professionally intertwined through a variety of album recordings and concert appearances, but they are all friends and fans of each other’s work as well. This was none more evident than on the constant chorale of “ghost harmonies” that wandered in and out of every song – even the new, unreleased ones. The friendly interactions that took place before, after, and during the songs showed evidence of a group of people that were fluent in each other’s lives. During normal songwriter rounds, you can usually spot the feigned interest of the performers as they wait for their spot to come back around. Whether they are thinking about their next song or the errands that they need to run the next day, the vacant gaze and forced banter always give them away. However, this was not the case at The Local Show, where each artist was fully engaged during each other’s songs – possibly even more so than during their own offerings. From a musical perspective, you’d be hard-pressed to find a more entertaining and enriching collection of songs packed into a single setting. There were lyrics crafted from the perspective of an abandoned, rusty Schwinn and a pre-suicidal cancer patient, as well as hymns of timeless modernity sung alongside humorously instructional odes on how not to get eaten by bears. The songs were all beautiful, haunting, resonant, accessible, and undeniably life-affirming in equal measure. These were not three-and-a-half minute pop ditties ephemerally meant to lighten a moment, but instead were carefully crafted refrains meant to help soundtrack a lifetime’s journey. With meditations like “Will we choose the noise of our desire or the hope that makes no sound” and simple reminders that “the sky must be enjoyed,” The Local Show reminded that there are good musical companions to walk with you along the way. Being a fan of all four artists, it was really nice to hear familiar songs in such a relaxed, intimate setting. The Well Coffeehouse provided an incredible atmosphere for the songwriters to sing their songs and tell their stories, while the lightening storm flashing through the wall of windows provided an arresting backdrop. At a point where technical glitches threatened to sidetrack the mood, Don Chaffer simply unplugged his guitar, rested a foot on the front row of chairs, and sang a gorgeous break-up ballad to a pin-drop quiet crowd. One of the bonus benefits to relaxed settings like this is that new songs usually see their first light of day. On this night, Randall Goodgame debuted a new song called “Cellphone Jones,” Eric Peters introduced “Nobody,” and Sandra McCracken played “God’s Highway,” “We Will Feast,” and “Gracious Light” from her recently-recorded-but-not-yet-released next album. Don Chaffer even read a stunningly wistful prose poem of his called “On the Iron Bar and the Price You Pay, James Dean” that had everyone simultaneously laughing and introspecting at the same time. All four artists set the precedent that you never know what might be in store for you at The Local Show but you can rest assured it’s going to be good. The Local Show will be looking to recapture the communal spark every other Tuesday in September, with plans to move to every week in October. The next show will be September 16 and will feature Jill Phillips, Andy Gullahorn, Andrew Osenga, and Jeremy Casella – another foursome whose professional/personal DNA mix together in a way that should provide the same uniquely communal atmosphere as the first show.